There are a couple of resources that explain the problem. Matt Whitteman wrote one and Prashanth Kaankadae wrote another. I don't like the idea of just blowing away all the cookies. Everyone is always in a hurry to recommend this approach to fix any IE issue, there are many good cookies and blowing them all away causes a lot of inconvenience. I prefer to dig in a little bit and just delete the ones causing the problems. In this case I believe I have it narrowed down the cookie you can delete and bring back your settings menu. First close Outlook & any open IE windows. Second open a Fresh IE Window. 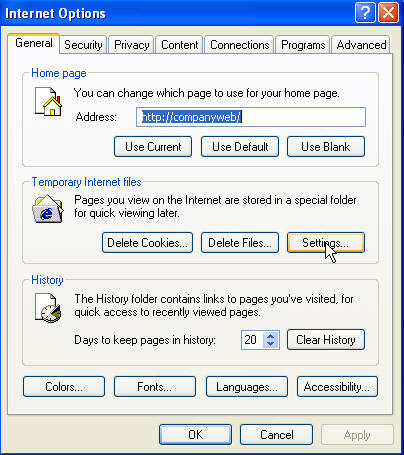 Third click Tools, Internet options on the IE toolbar. Now Click the View Files button.